Bookmaker bet paid as cash out as winner if your team goes 2 goals up! Step 3) Your Team Has Gone 2 Goals Up! Additional Tip - Don't Forget Matchbook! Bet365 and Paddy Power both run this excellent football refund offer. Note if you are looking for a guide on the Early Payout Calculator, please see this guide. It is the most popular football refund offer for matched betters because, once you have learnt how to complete offer using this guide, it is quick and easy to do! Simply back and lay teams with very close odds between the bookmaker and the exchange. Then sit back and hope that the team you back goes 2 goals up (e.g. 2-0, 3-1)! Lock in a small profit by cashing out your lay bet. This means you only pay out a portion of liability on initial lay bet whilst still winning the full amount on Bet365/Paddy (as they have paid out). 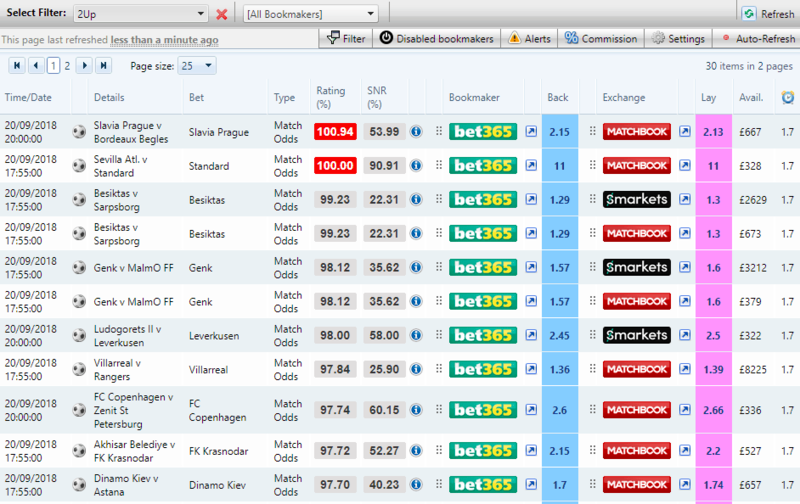 Hope to make a big profit by doing nothing and hope the opponents score 2+ goals so your team draw or lose the game. This means you win both the lay stake and the Bet365/Paddy back bet. There is no maximum stake, usually I will go for between £50 to £100, you could put on a lower stake and still make a profit! Your average profit from this offer is usually £2 to £3 based on a stake of £50 to £100 and choosing 97%+ rating teams. For 5 minutes work, this is well worth doing! Please note you can go many games without your chosen teams going 2 goals up, so this is not entirely risk free, but is still low risk given it is just small trigger bet losses for each team you back and lay. You should receive a message in your Bet365 inbox to say you are included in the 2Up offer. If you are gubbed, you are not eligible unfortunately. Previously if you were gubbed you would still receive this offer, but in their latest gubbing email they say you are not eligible for 2up. Close odds (97%+) is essential for this offer because the likelihood of your team going 2 goals up is low. This means you will incur numerous trigger bet losses until you can profit from this offer by your team going 2 goals up. Therefore, in order to make this offer profitable in the long term, keeping the trigger bet losses low is key! Mid to high odds (1.7 and above) is also essential for this offer because if you choose a strong favourite with low odds (<1.7), then when they go 2 goals up, the likelihood of the underdogs coming back to draw or win is extremely low. OddsMonkey launched a brilliant 2up filter in the OddsMatcher. Nice and easy, just place your back bet on Bet365 or Paddy Power and lay as normal in the calculator. You will make a small trigger bet loss of up to 3% of your stake (i.e. up to £3 loss from £100 staked). It is now just a case of waiting and see if your team goes 2 goals up! If your team has gone 2 goals up, brilliant! Option 1) Lock in a small profit by cashing out your lay bet. Once your team has gone 2 goals up, you have won the bookmaker bet! However, you don't need to pay out the full liability of your lay bet because there is a still a slim chance your team won't hold their 2 goal lead. Both Betfair and Smarkets give you the option to 'cash out' your lay bet. In effect, this means that if there is an 10% chance your team won't hold their 2 goal lead, then you can immediately cash out and lose only 90% of the liability. Man Utd go 2 goals up after 30 minutes hurray! You have won your £100 Bet365 bet for £150 cash profit. The odds have dropped to 1.3. You can simply click 'trade out' in Smarkets and you will then pay out only £120 liability rather than the full £152 liability. You have made a £30 net profit being £150 winnings on Bet365 less £120 loss on Smarkets. 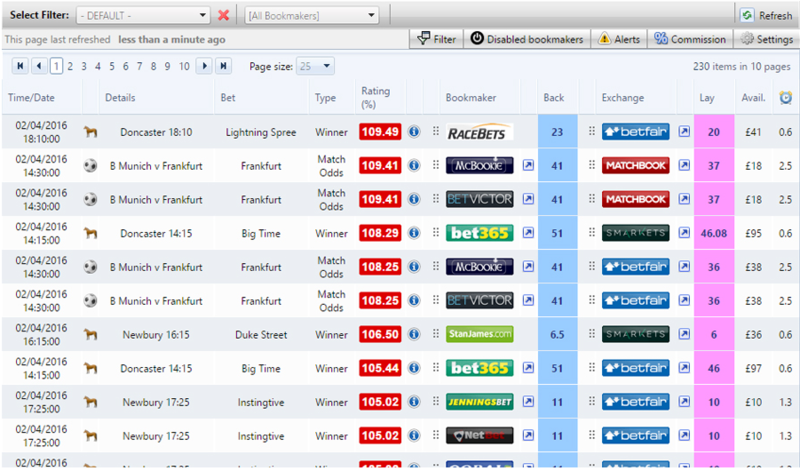 Check out the Betfair Cash Out and Smarkets Trade Out guide if you are new to using this feature. Alternatively, rather than using the 'cash out' or 'trade out' you can manually calculate the back stake to place on the exchange to manually cash out your lay bet. 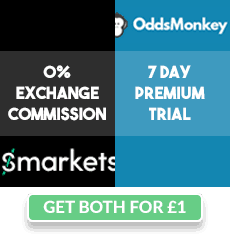 You can do this by using the OddsMonkey Early Payout Calculator. The Early Payout Calculator is very helpful when you have multiple lay bets on the same game, but only one relates to your 2Up offer. You can therefore just cash out your lay bet relating to the 2Up offer. Here is the Early Payout Calculator guide. Option 2) Hope to make a big profit by doing...nothing! If you aren't online when the game is running or you're simply looking to save time, you can just hope that once your team has gone 2 goals up, they surrender their lead and end up drawing or losing the game. This means you win both your Bet365/Paddy bet and your exchange lay stake. Whilst this is unlikely to happen, over the longer term it has the same expected profit as Option 1), it just has bigger swings as you aren't cashing in small profits each time your team goes 2 goals up. Man Utd go 2 goals up and then Everton come back and the game finishes 2-2. You have won your £100 Smarkets lay bet for £98 cash profit. (after £2 commission). You have made a £248 profit being £150 winnings on Bet365 plus £98 on Smarkets. If I am online then I'll check every so often to see if the team are 2 goals up. If so, great I'll cash out for a small profit. If I am offline then I'll just hope when I check the results that I was lucky and my team when 2 goals up only to then surrender their lead and the game ends in a draw or lose for them! 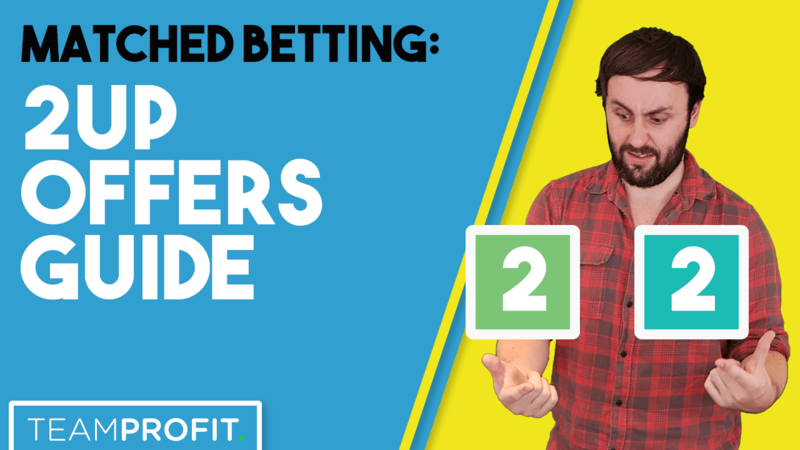 You may be familiar with using Betfair and Smarkets as your two exchanges. Definitely consider using Matchbook too, they have some of the best football lay odds, plus 0% commission on all sports for new Matchbook customers. If you are an existing customer, you pay 1.5% commission on both winning and losing lay bets so enter 0% as the back and lay commission. Until recently, I didn't use Matchbook given I had always been happy with Betfair and Smarkets but I now regularly use Matchbook too to help make some extra profit! It is best to back teams with higher odds, quite often I'll see teams with odds between 3.0 to 7.0 in my OddsMonkey alert which is ideal. The reason higher odds is better, is because once your team goes 2 goals up, their exchange odds will still be reasonably high (1.2 to 1.5) so you can cashout and lose less liability in the exchange (than if the odds were 1.01 to 1.2). This is because your team are the underdog in the game and so the favourite still has a reasonable chance to score 2 goals to get it back to a draw. Scroll right to see the profit column. Please note these odds once 2 goals up are just approximate odds. The actual odds will depend a lot how early your team goes 2 goals up. For example, if your team goes 2 goals up in the 20th minute, the odds will be reasonable (1.1 to 1.5), if your team goes 2 goals up in the 80th minute, the odds will be 1.01 so there is almost no profit in the cashout. For this reason, I'll usually only for 1.7 to 2.0 back odds with a 98% rating, whilst I'll be happy to go for 97%+ when the odds are greater than 2.0. Also for reference, the exchange odds to look for when cashing out are the back odds, this is because to cash out the lay bet the exchange places an opposite back bet. For details on this, please see the Betfair Cash Out & Smarkets Trade Out guide. I hope you have found this 2Up guide helpful and if you have any questions please do see below for how to reach out thanks!